On Friday 22nd March 2019, Farhad Huseynov (ESR7) became the fifth TRUSS ESR in successfully defending his doctoral thesis in front of an examination panel appointed by the Postgraduate Committee at University College Dublin (UCD). The thesis, titled “Bridge Condition Assessment Methods Using Rotation Measurements”, was supervised by Prof. Eugene OBrien from UCD, Dr. David Hester from Queen’s University Belfast and Prof. James Brownjohn from Full Scale Dynamics Limited. The defence was held in meeting room G99 of Civil Engineering in Newstead Block B. 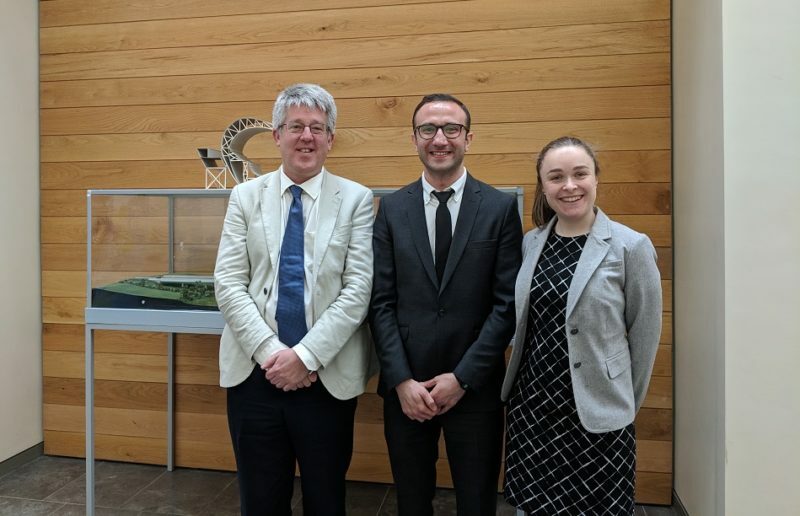 The jury was composed by Prof. Tim Ibell (External Examiner from the University of Bath), Dr. Jennifer Keenahan (Internal Examiner from UCD), and Dr. Shane Donohue (Chair from UCD). Following TRUSS, Farhad Huseynov will start to work as Senior Bridge engineer for RPS (www.rpsgroup.com) in Cork (Ireland) in April 2019. The main research contributions by Farhad during TRUSS are summarized in the abstract of his thesis given below. Most bridge condition assessment methods available in the literature are based on deflection, acceleration or strain measurements. Although current technology enables the measurement of rotational deformation on a bridge structure with high precision, the potential of rotation measurements as a main parameter to identify damage has not been thoroughly investigated. This is the main focus of this dissertation. Initially, the sensitivity of rotation as the main parameter to identify damage is investigated through numerical analyses carried out on a 1-D simply supported bridge model. It is shown that when local damage occurs, even when it is remote from a sensor location, it results in an increase in the magnitude of rotation measurements, proving that rotation is a parameter that is sensitive to damage. This fact is exploited in a Bridge Weigh-In Motion (B-WIM) algorithm to develop a novel bridge damage detection methodology. Broadly speaking, in the proposed method, damage manifests itself as an increase in mean rotation. However, rather than looking directly at rotation values which are subject to natural variations, in this method, the rotation measurements are used in a B-WIM algorithm to predict the axle weights of the passing vehicles. This has the effect of separating the contributions of individual axles to the rotation signal, thereby removing the influence of vehicle configuration (axle spacings and relative axle weights). Providing that the influence line is not recalibrated after damage takes place, the damaged bridge gives an increase in the inferred weight. Unlike directly measured rotations where the ‘healthy-bridge answer’ is unknown, when working with a traffic population, the healthy bridge answer can be found – it is the statistical distribution of vehicle weight data for the site. This is generally repeatable – for example, the mean and standard deviation of fully loaded 5-axle trucks tend to remain the same from month to month. The capability of the proposed method to detect local damage on a bridge structure is demonstrated through numerical analysis carried out on a simply supported bridge model using real ambient traffic data obtained from 5 years of Weigh-in-Motion data from a site in the United States. The results and the specific details of the proposed methodology are elaborated in Chapter 2. The next chapter develops a new bridge damage detection methodology using direct rotation measurements. Through initial numerical analysis carried out on a 1-D bridge model, it is shown that the difference in the rotation responses of a bridge to a moving vehicle obtained for healthy and damaged bridge states can identify damage and its location. Subsequently, a sophisticated 3-D dynamic Finite Element (FE) model of a 20 m long simply supported bridge structure is used to test the robustness of the proposed damage detection methodology under more realistic conditions. An extensive range of damage scenarios is investigated using the FE model. These simulations were performed as ‘blind’ tests, i.e., the damage states were not available to the candidate before submitting the damage detection findings to a collaborator. The results of these studies are presented in Chapter 3.